What is Cookies Control extension? 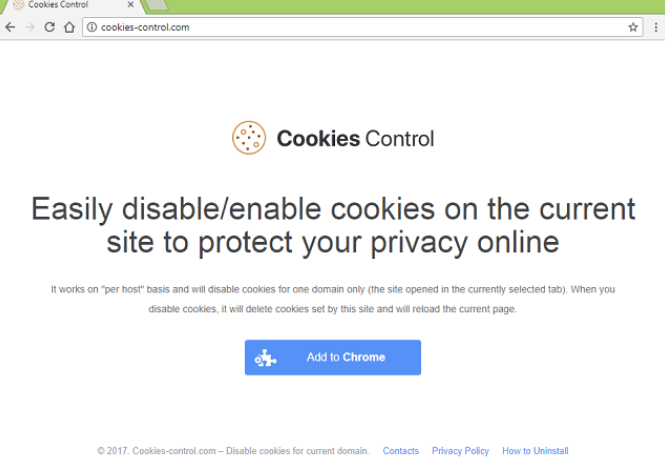 Cookies Control extension is a browser extension working on Google Chrome only. It tells that it can make it possible to manage browser’s cookies easier; however, this is not the reason to keep it installed, especially if it has been installed on your computer without permission. We cannot confirm whether this extension works beneficially, but we can assure you that it is not perfect. What malware experts have revealed about it is that this browser extension might start generating annoying advertisements on users’ screens. These advertisements will show up on your screen promoting various products, and we are sure you will find them annoying sooner or later. Do you already see ads on your screen? The best you can do about that is going to uninstall Cookies Control extension from your web browser. The only way to stop those ads from coming on your screen is to disable this browser extension. What does Cookies Control extension do? How did Cookies Control extension enter my computer? You see Cookies Control extension active in the list of add-ons not without reason. There are three possible reasons why you have detected it on your PC. First, you could have downloaded it from a third-party page. Second, you could have clicked on a pop-up advertisement advertising it. Third, you could have downloaded it from its official website, but it is not very likely that it exists. In any event, you must delete Cookies Control extension from your browser because it is not a trustworthy browser extension. How do I remove Cookies Control extension? You should delete Cookies Control extension from your browsers today if you have found this extension active on your PC but cannot remember downloading it. Additionally, you must implement the Cookies Control extension removal if you have found it useless. You can delete Cookies Control extension either manually or automatically. If you adopt the first method, you will need to implement the Cookies Control extension removal yourself. In the case of an automatic method, an automated security application will remove this infection for you.